For successful hunting for a goose the bait is necessary. The greatest effect is given by profiles and stuffed geese. They attract their relatives, giving them the impression of a lively flock. Seeing the birds, a flock sits near them. At this point, the hunter opens fire. The printed or drawn image of the goose is cut off and outlined its outline: on one sheet the whole body, on the other – only the wing. Attach the templates to the foam sheet and outline with a pencil. 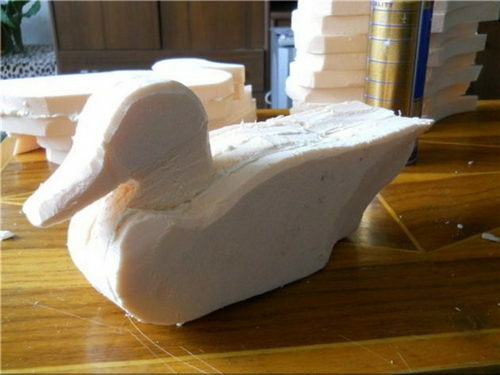 To create one stuffed animal you will need 2 profiles of the whole body of the bird and 2 profiles of the wings. Cut out the profiles on the markup. Extruded foam sheet is easy to cut with a construction knife. We glue the profiles with a can of foam. Put the connected parts under the press. Another option: we clamp the parts into clamps. After about 35-40 minutes, when the parts grab, you can begin to process them. We start with roughing the surface with a construction knife. Then additionally level the surface with sandpaper. In order for the goose to be stable in water, you will need a keel. We make it from a fragment of a metalplastic pipe. Holders for it are installed in pre-made holes in the bottom of the models. Fixed with foam. Note! Embezzled geese should have the most realistic look. It is recommended to impregnate plywood profiles with linseed oil. This will make the material waterproof. After all, even if the dummy is not in the water, it will still be exposed to moisture in an open area. Thoroughly need to be treated with linseed end parts of the layout. Paint should be applied only on a completely dry surface. Most often, layouts are painted with oil formulations with the addition of a small amount of kerosene. This component will allow you to get a matte surface that will not shine. A good choice – water-based paint. Pigment of the desired color is added to the white base. The resulting coating will be dull. Metal profiles cut out with special scissors. Next, we clean the edges from burrs. Prepared parts align with a mallet. Beginners are wondering whether to choose galvanized iron for making a model. The paint on galvanizing does not hold too reliably, so the models have to be tinted periodically. But galvanized metal almost does not rust. In non-galvanized iron, the virtues are reversed. However, the rusty surface in color resembles the plumage of the mallard and, moreover, does not shine. Although it should be noted that colored products last much longer. Alternatively, some steel masters choose aluminum or plastic. The disadvantage of these materials is that the paint does not adhere well to them. The success of hunting depends on the correct arrangement of baits. 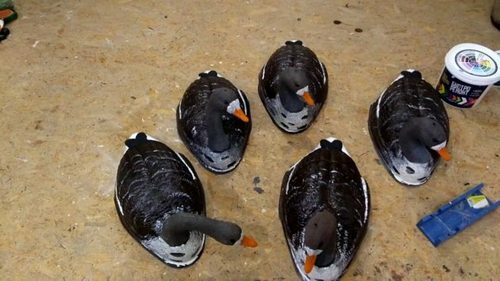 Profiles need to be installed at different angles of view, so that, depending on the approach side, the flock sees solid images of birds, and not end parts. In the center, images of feeding geese are usually placed, and at the edges, guards. Before planting, a flock of geese makes 1-2 circles to ensure the safety of the site. 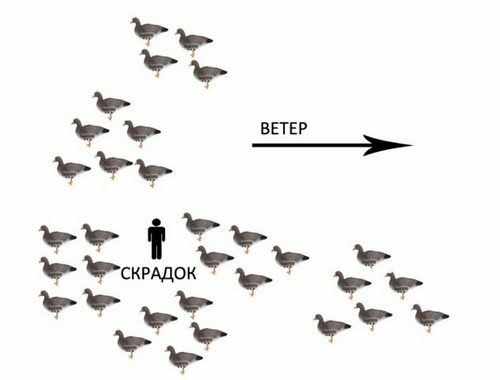 If flocks are circling, but do not sit down, and this is not the first time, you need to think about the effectiveness of the bait. Geese do not sit on the edge of the field, they choose a place 200–300 m from the border or closer to the middle of the plot. A small flock (up to 20 birds) is kept in a heap, at a distance of 2-3 m from each other. In a small flock there are at least 1–2 watchmen. Large flocks are less compact, here the birds are separated from each other at distances of 3–6 m.
Note! Geese never move in a line. Stuffed geese are encouraged to arrange the arc, horseshoe, comma, in the form of letters V or J. This arrangement will allow the birds to sit down quickly to find a place among the models. Layouts need to be turned headlong into the wind. Hunting will require a large number of stuffed animals or profiles – at least 30–40 units. The more impressive the flock, the better, since geese prefer to sit down at large concentrations of birds. The lures themselves should be as realistic as possible, preferably full-volume. An example of a proper fit is shown in the figure below. 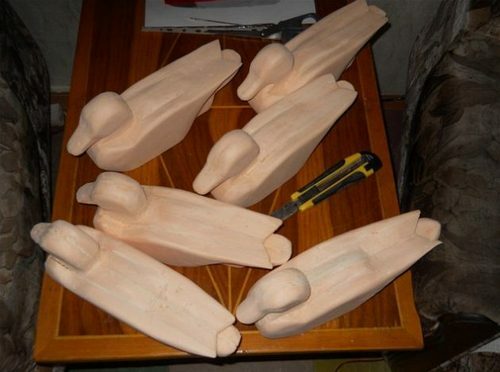 Experienced hunters place dummies in small “families” – 10–12 units each. There is a small distance between families (up to 10 m). Seated in a semicircle, the area of ​​the proposed landing is inside this figure. Here and equip hunting ambush (zasidku). Moving layouts are always preferable to static ones. They create the effect of a living bird, so geese sit down more willingly to such dummies. Shiny stuffed animals scare away wild birds . Such products are often found in the low price category. However, shine can appear on the most expensive stuffed animal, if you leave it at night outside. By morning, the surface of the model is covered with frost, as a result of which it begins to shine. Goose hunting will not be successful if the birds are placed too close to each other. For them, this is a clear signal of danger, because a flock behaves this way when something threatens her.